Parking spot No. 24 in Ridgewood is an excellent spot for parking. It sits across Walnut Street from Memorial Park, smack in the middle of the downtown shopping district, next to the Alex & Ani jewelry shop and close to popular places like Starbucks, the Warner movie theater and the Country Pancake House. Spot No. 24 is so good, in fact, that it's nearly impossible to park there. This was especially true on Saturday, one of the busiest holiday shopping days of the year, when a combination of heavy traffic downtown, a festival for small retailers and a strictly enforced time limit of 15 minutes per car drove several drivers a little nutty. "What! I can only park here for 15 minutes? Ugh," said Derek Prevete, 25, a Wanaque resident who had spent 15 minutes circling for a place to park. "This place is so annoying." Other people, mostly longtime Ridgewood residents, know about spot No. 24's special qualities — convenience, high turnover, high risk — and planned accordingly. Sheila Jamroz Shilling pulled into the spot at 12:49 p.m. Saturday and waited in her black Chevrolet Bolt as her husband hustled into the post office across the street to mail a package of coffee to California. She didn't get out of the car to feed the meter. Rather, she continually checked her mirrors for any lurking traffic cops. "I know people complain about the parking here," said Shilling, 63, a Ridgewood resident who co-owns the Bluestone Coffee Co. in Montclair. "But today we have to be quick, so this spot works fine." The month leading up to Christmas is never relaxing. Buying gifts and preparing for holiday parties require so much driving, especially in North Jersey, where the roads are so busy on weekends it seems every last one of the region's 1.5 million people is out running errands. The roads are most intense near the area's malls and in traditional downtowns like Ridgewood's, where a combination of upscale shops and limited space for cars can easily lead to gridlock. 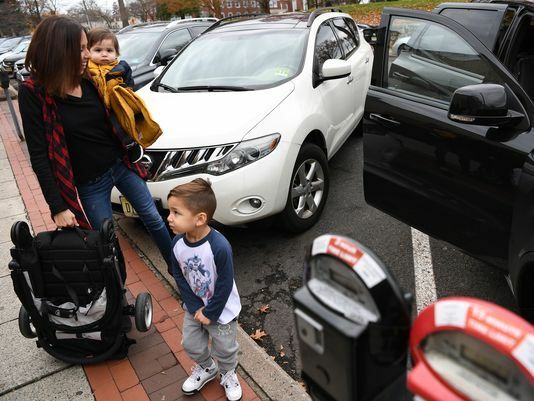 Parking is a perennial issue in Ridgewood, where an annual permit to park in a village-owned lot costs $750 for residents and $1,500 for nonresidents, and a parking ticket costs $25. Crowding was especially intense this weekend because of Ridgewood's Small Business Saturday festival, held to encourage shopping at local retailers. The event included hayrides through the center of downtown in a wagon pulled by two enormous horses, which further tangled traffic. "It took forever to find this spot," said Ivana Vasilic, who parked her red Toyota Rav4 in spot No. 24 on Saturday to shop at a nearby store for curtains. "There are so many cars, and my baby's in the back getting fussy. I don't have much time." Here in this crowded place, spot No. 24 shines. Unlike the other spots on Walnut Street, which allow parking for up to two hours, its meter wears a red cap, alerting would-be lollygaggers to its special hurry-up status. Occupying the space for the maximum time allowed costs 15 cents, or one penny per minute. Most people who parked there on Saturday were in a hurry, however. So they pumped in quarters, trading spot No. 24's convenience for an extra dime. "It was such a relief to find this spot because I'm in such a hurry," said Danielle Gutierrez of Wyckoff, who planned to shop at a clothing store called Suite 201 for a dress to wear to a baby christening at the Alpine Country Club. Gutierrez parked her black Dodge Durango at 11:57 a.m. The ceremony was to start at 2 p.m.
"I'm a little stressed," she said. The strict time constraints of spot No. 24 made some shoppers feel a little foolish. Ali Ahmed planned to hang out at the Tobacco Shop, a cigar store and lounge on Ridgewood Avenue, and maybe buy some Davidoff cigars as Christmas presents. He parked his silver Mercedes-Benz C240 in The Spot, got out and read the sign that warns in bright red letters about the meter's strict 15-minute limit. Then he climbed back into his car to look for another spot. "I should have started looking for a place to park a few blocks away," said Ahmed, 29, of Fair Lawn. "Rookie move." Others found spot No. 24 perfectly suited to their needs. Vivian Covello drove from her home in Upper Saddle River to buy jewelry at Alex & Ani for her nieces. "Coming here is always a risk because you don't know if you can find parking," said Covello. "And when you're shopping you're always worried you're out of time on the meter." But this Saturday, everything worked fine. Covello parked her silver Volkswagen Tiguan in spot No. 24, trotted into the store, bought a few trinkets and came back outside with four minutes on the meter to spare. Even so, Covello did not linger. She was sorry, she explained, but now she was running late for a family party. "This is not leisurely. I was worried it might not work," Covello said about searching for parking on her tight schedule. "But then I found this spot. Today was my lucky day."